Scott Pruitt has hired a Republican opposition research company -- ordinarily used for political campaign purposes -- to find employees that disagree with the Trump agenda, all on the government's dime. though his agency already has one he can use nearby. One of the top executives of a consulting firm that the Environmental Protection Agency has recently hired to help it with media affairs has spent the past year investigating agency employees who have been critical of the Trump administration, federal records show. The firm, Definers Public Affairs, based in Virginia, specializes in conducting opposition research, meaning that it seeks to find damaging information on political or corporate rivals. A vice president for the firm, Allan Blutstein, federal records show, has submitted at least 40 Freedom of Information Act requests to the E.P.A. since President Trump was sworn in. Many of those requests target employees known to be questioning management at the E.P.A. 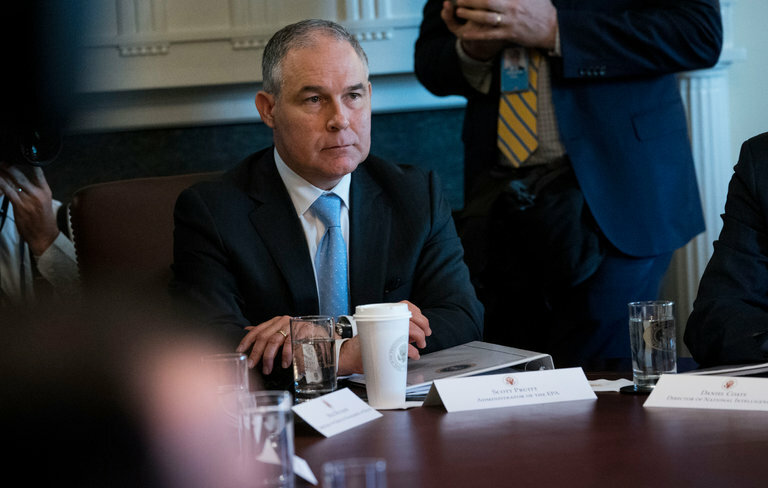 since Scott Pruitt, the agency’s administrator, was confirmed. The contract, which was awarded this month, is part of an unconventional news media operation that Mr. Pruitt has set up at the agency as he tries to get a handle on the coverage of him by newspapers, including The New York Times, and criticism by Democrats in Congress and environmental groups. The decision to award the contract was first reported by Mother Jones. The founders of Definers, Joe Pounder and Matt Rhoades, are longtime Republican political operatives. Mr. Pounder was the research director for the Republican National Committee and worked on the presidential campaign of Senator Marco Rubio of Florida in 2016. Mr. Rhoades managed Mitt Romney’s presidential campaign in 2012. Okay. Scott Pruitt is using taxpayers' money to hire a Republican firm to rid a government agency of employees in non-political positions if they have political beliefs that run counter to his -- mostly anti-environmental -- agenda. Good to know.